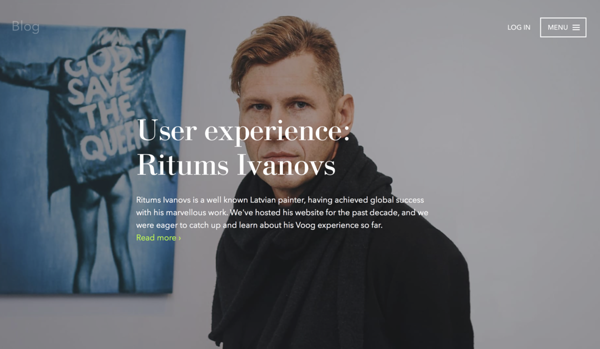 On June 15, the Estonian Voog published an interview with Ritums who has been using their web tool for over 10 years now. Voog is the best tool for building and managing exceptional websites and online stores: it is easy to use, yet super flexible at the same time. Behind Voog stands a team of 12 skilled craftsmen and its founders’ day-to-day experience in web design dates back to the 1990s. Were there any hesitations when you had to choose relatively unknown tool next to giants like WordPress, Joomla, Squerspace etc? Thats great to hear! Our goal is to provide a website creating tool for both people with little to none web experience as well as to the developers with specific, technical needs. We would like to thank you Ritums Ivanovs for his time and here's to another decade of good partnerships! Author of the interview: Mathias-Erik Tempel, the dude who stands behind Voog marketing plans. He is also the general manager of the team and handles customer relationships. Voog — Create a beautiful multilingual website from Voog on Vimeo.